Ubisoft have cherry-picked everything that has made the Far Cry series successful, and distilled it into a single, laser-focused package. Far Cry 5 probably isn't going to blow anyone's mind, but it provides a continuously fun experience that avoids the repetition and formulaic nature of past titles. The Far Cry series has been in a bit of a weird spot the last few years. From Far Cry 3: Blood Dragon, that wowed with its gorgeous visuals and over-the-top humor, to Far Cry: Primal‘s weaponized wildlife, we’ve seen a series trying plenty of new things. But if I had to put it simply, it’s felt a little all over the place. I worried wacky settings and gameplay gimmicks were becoming the replacement for good fundamentals and compelling storylines. So here we are with the new, main-line entry that is Far Cry 5. 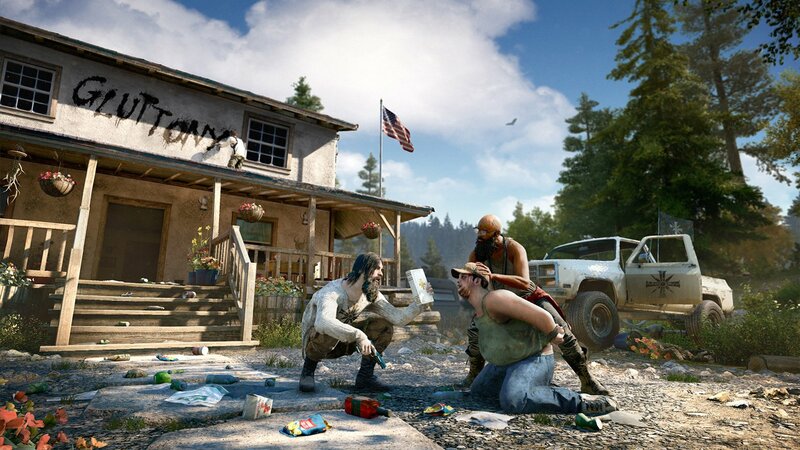 Forget exotic jungles and lore-rich ruins, we’re knee-deep in America (read: Mericuh). Much to my surprise, the move to a more familiar locale has left the series feeling fresher than ever. The very name Hope County, Montana tells us about everything we should expect from the game’s setting. This is a land of religion, traditional values, and beautiful vistas. What it might not tell you is that there’s a sadistic and zealous cult working its way through the bloodstream of the county’s infrastructure, corrupting and policing every aspect of life here. 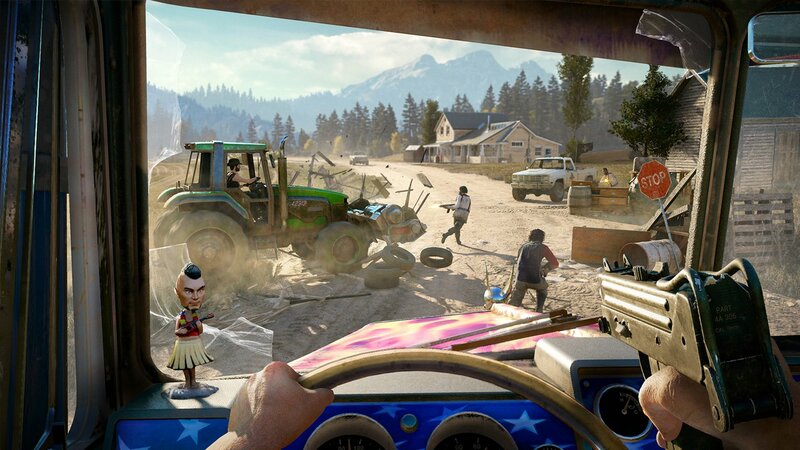 This tension is ever-present in Far Cry 5‘s world, as civilians and cultists collide dynamically on roads and near encampments. Ubisoft has been an industry leader in making their worlds feel full of life and struggle, and Hope County is certainly no exception. The cult, known as Eden’s Gate, is preparing for the impending end of the world they call “The Collapse.” Their motivations aren’t strictly politically motivated; that is to say they aren’t alt-right boogeymen. In fact, as far as I can tell they aren’t even racist (several of the cult’s members are POC). Far Cry 5 handles its politics by just.. not really having any. This might not be an easy pill to swallow for some, especially following something as bold as Wolfenstein 2‘s marketing campaign, but it’s pretty much to be expected. I can’t say I’m disappointed, because this is highly preferable to the game fumbling, gun violence, political corruption, and the trappings of racism in America. I do wish that, at the very least, some of these issues would have been addressed, but the caricature that is Hope County is so deeply seated in zealous religion that its tone more or less hits the mark without them. Unlike previous Far Cry games with fixed protagonists, you play as a nameless, customizable character. This greatly serves the game’s immersion, because it allows for more self-insertion and player-driven motivations. You simply play The Deputy (think Fallout: New Vegas‘ The Courier), sent to Hope County to arrest Joseph Seed, the leader of Eden’s Gate. This goes about as well as you’d expect, and before long, the player is plopped into the center of the map, free to explore in any direction they choose. Not having a voiced main character may not do the game’s narrative any favors, but I much preferred it to the haphazard motivations of the previous games’ protagonists. 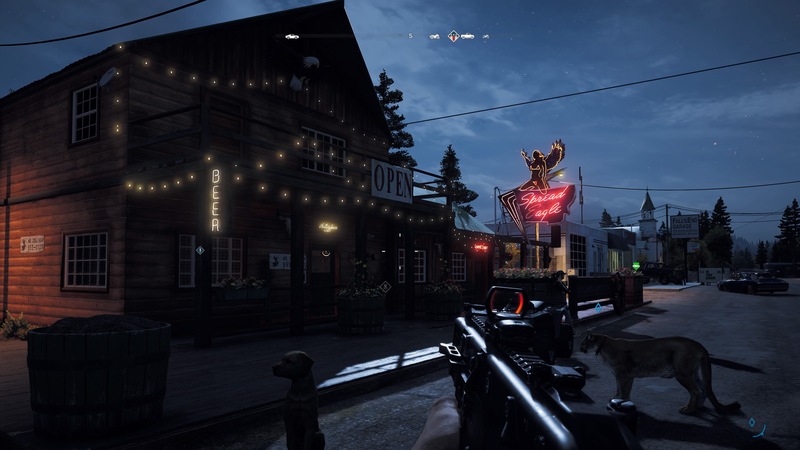 Far Cry 5 offers more changes than this, however, and there are several immediately-noticeable quality of life improvements. The most important change is easily the lack of a minimap. Instead of staring at bunch of little icons your eyes will be focused on what’s ahead of you, making world exploration feel much more rewarding. Even more to my liking is that there’s no longer a need to craft ammo, weapon, and money holsters. The core gameplay loop of the older games was so easily disrupted by banal hunting excursions that their absence makes the whole experience more focused. You can still go hunting in regions dedicated to their respective animal, but you’ll be doing so to either serve the story or make some quick cash. Other minor changes include the lack of clunky looting animations, and the freedom to move around when talking to NPCs. There’s also the new companion system, which features permanent installments to a roster of NPCs that can help you throughout the game. Each of these characters has a unique ability, making them invaluable for taking down outposts full of enemies efficiently. Boomer, “The Good Boy,” marks nearby enemies automatically, for example. 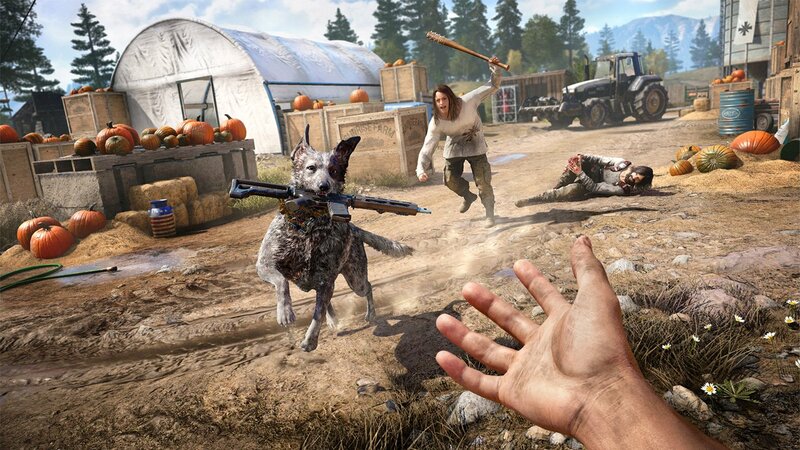 Far Cry 5 is balanced around having at least one of these companions by your side, so trying to go alone might be considered the game’s ‘hard mode.’ Luckily, I never found my companions wandering into trouble I didn’t want to be involved in or getting stuck somewhere. All I had to do was command them to move to an area and watch the fireworks, making strategic placement of key allies a fun and interesting new mechanic. The series is well-known for its intriguing, well-written villains. Far Cry 4‘s Pagan Min was notoriously so likeable some players didn’t even want to kill him. 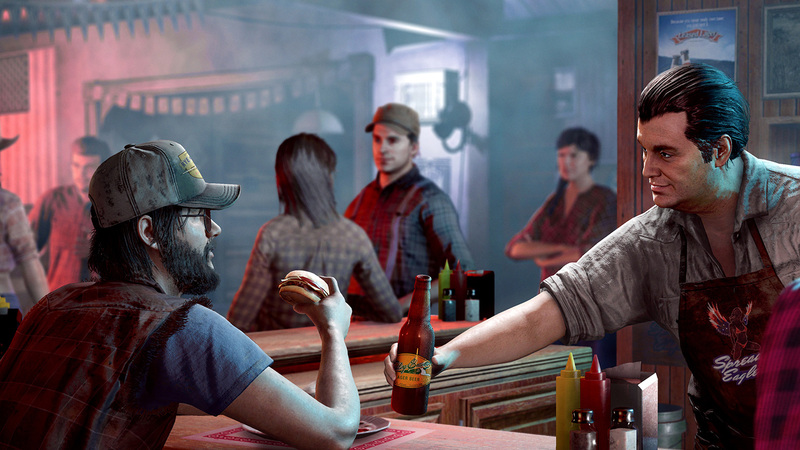 Joseph Seed, the antagonist of Far Cry 5 follows this trend beautifully, being not only complex, but also having motivations that aren’t too far-fetched to be believable. In a world full of chaos and destruction, which we all see in the headlines every day, Joseph wants to recreate a more simplistic and primitive society for the righteous few to enjoy after The Collapse. He, along with the three other big-bads, have wonderfully-written dialogue and compelling performances that make them feel like more than just targets to kill. While exploring the world’s three distinct regions, each featuring one of these ‘boss’ characters pulling the strings, Far Cry 5 felt like it was constantly trying to get my attention. I couldn’t drive for more than thirty seconds without running into the same two or three scripted events occurring on or around the road, and it quickly wore on my nerves. The game is very good at giving the player things to do; I just wished it would spread them a little more thin, so I wasn’t constantly being bombarded with enemies and silly, repetitive diversions. When it comes to the missions proper, Far Cry 5 handles its pacing much better. There’s a pretty diverse amount of objectives, from destroying a giant statue to escaping a flooding bunker, but they all end in blood one way or another. It’s a good thing, then, that the player is given so many options for tackling each mission. Sometimes I zip-lined in with a grenade launcher; others I sent in my cougar Peaches to stealthily crush throats while I picked off enemies with a bow. My favorite way of cleaning house was easily lighting the whole place up from afar with a gunship. However you want to play it, Far Cry 5 feels great in the hands, and there are plenty of systems ripe for exploration. Moving onto things that are ripe for exploitation, there are microtransactions in Far Cry 5. If you’re surprised by this, I’d like to welcome your long-awaited return to the human race, please enjoy your stay. There’s a currency apart from cash called Silver Bars. As soon as I saw that little currency symbol my heart sank; I knew there would be either a long grind ahead or I would be missing out on some of the cooler vehicles and weapons. Turns out: I was wrong. Everything in Far Cry 5 is easily affordable with player-earned currency. Even the most powerful helicopters, equipped with machine guns and rockets, can be afforded after about an hour (if that) of regular play. Silver Bars are hidden at every outpost, so if you see something you really want right now you should be able to afford it. This begs the question of why these bars are even purchasable in the first place, but I’m not here to tell Ubisoft how to milk their playerbase. The bottom line is that they’re in the game, which is a bad look, but they’re surprisingly non-obtrusive. 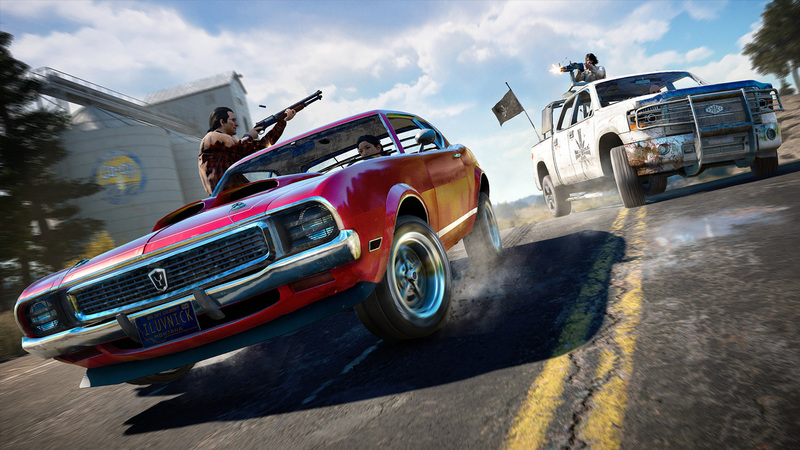 Far Cry 5 also features an Arcade mode, allowing players and their friends to play through community-made maps and challenges. Playing through a few of these, I was astounded at how much detail could be incorporated into each mission. There’s dynamic lighting from standing lamps, terrain deformation, and you can even construct entire buildings from scratch. Since these maps can feature assets from not only other Far Cry games, but also Assassin’s Creed, they feel entirely distinct from the game itself. I’m excited to see how this community-driven feature grows, and I have a feeling we’ll be seeing plenty of unique and nightmarishly-difficult maps in the near future. Cruising around Hope County in a muscle car, I came across a radio station dedicated to garage rock, one of my favorite genres. I was floored when I heard not only Thee Oh Sees, but also King Khan and the BBQ Show, two lesser-known bands I’m very fond of. These little flourishes of personality are everywhere in Far Cry 5: you can pet your animal companions on command, there’s a self-referential radio tower joke, and I could spend hours fishing in its beautiful lakes. I was surprised to see this kind of heart in such a big-budget title, and these small touches make Far Cry 5 easy to fall in love with. Ubisoft have cherry-picked everything that has made the Far Cry series successful and distilled it into a single, laser-focused package. Far Cry 5 probably isn’t going to blow anyone’s mind, but it provides a continuously fun experience that avoids the repetition and formulaic nature of past titles. This review is based off time spent playing on a PlayStation 4 Pro. A copy was provided to us by Ubisoft.